Not to be confused with Factor X (hemin) found in Chocolate agar. For other uses, see Factor X (disambiguation). Factor X, also known by the eponym Stuart–Prower factor, is an enzyme (EC 3.4.21.6) of the coagulation cascade. It is a serine endopeptidase (protease group S1, PA clan). Factor X is synthesized in the liver and requires vitamin K for its synthesis. Factor X is activated, by hydrolysis, into factor Xa by both factor IX (with its cofactor, factor VIII in a complex known as intrinsic Xase) and factor VII with its cofactor, tissue factor (a complex known as extrinsic Xase). It is therefore the first member of the final common pathway or thrombin pathway. It acts by cleaving prothrombin in two places (an arg-thr and then an arg-ile bond), which yields the active thrombin. This process is optimized when factor Xa is complexed with activated co-factor V in the prothrombinase complex. Factor Xa is inactivated by protein Z-dependent protease inhibitor (ZPI), a serine protease inhibitor (serpin). The affinity of this protein for factor Xa is increased 1000-fold by the presence of protein Z, while it does not require protein Z for inactivation of factor XI. Defects in protein Z lead to increased factor Xa activity and a propensity for thrombosis. The half life of factor X is 40–45 hours. The first crystal structure of human factor Xa was deposited in May 1993. To date, 191 crystal structures of factor Xa with various inhibitors have been deposited in the protein data bank. The active site of factor Xa is divided into four sub pockets as S1, S2, S3 and S4. The S1 subpocket determines the major component of selectivity and binding. The S2 sub-pocket is small, shallow and not well defined. It merges with the S4 subpocket. The S3 sub-pocket is located on the rim of the S1 pocket and is quite exposed to solvent. The S4 sub-pocket has three ligand binding domains: the "hydrophobic box", the "cationic hole" and the water site. Factor Xa inhibitors generally bind in an L-shaped conformation, where one group of the ligand occupies the anionic S1 pocket lined by residues Asp189, Ser195, and Tyr228, and another group of the ligand occupies the aromatic S4 pocket lined by residues Tyr99, Phe174, and Trp215. Typically, a fairly rigid linker group bridges these two interaction sites. The human factor X gene is located on chromosome 13 (13q34). Inborn deficiency of factor X is very rare (1:1,000,000), and may present with epistaxis (nosebleeds), hemarthrosis (bleeding into joints) and gastrointestinal blood loss. Apart from congenital deficiency, low factor X levels may occur occasionally in a number of disease states. For example, factor X deficiency may be seen in amyloidosis, where factor X is adsorbed to the amyloid fibrils in the vasculature. Deficiency of vitamin K or antagonism by warfarin (or similar medication) leads to the production of an inactive factor X. In warfarin therapy, this is desirable to prevent thrombosis. As of late 2007, four out of five emerging anti-coagulation therapeutics targeted this enzyme. Inhibiting Factor Xa would offer an alternate method for anticoagulation. Direct Xa inhibitors are popular anticoagulants. Polymorphisms in Factor X have been associated with an increased prevalence in bacterial infections suggesting a possible role directly regulating the immune response to bacterial pathogens. The factor Xa protease can be used in biochemistry to cleave off protein tags that improve expression or purification of a protein of interest. Its preferred cleavage site (after the arginine in the sequence Ile-Glu/Asp-Gly-Arg, IEGR or IDGR) can easily be engineered between a tag sequence and the protein of interest. After expression and purification, the tag is then proteolytically removed by factor Xa. Factor Xa is the activated form of the coagulation factor thrombokinase, known eponymously as Stuart-Prower factor. Factor X is an enzyme, a serine endopeptidase, which plays a key role at several stages of the coagulation system. Factor X is synthesized in the liver. The most commonly used anticoagulants in clinical practice, warfarin and the heparin series of anticoagulants and fondaparinux, act to inhibit the action of Factor Xa in various degrees. Traditional models of coagulation developed in the 1960s envisaged two separate cascades, the extrinsic (tissue factor (TF)) pathway and the intrinsic pathway. These pathways converge to a common point, the formation of the Factor Xa/Va complex which together with calcium and bound on a phospholipids surface generate thrombin (Factor IIa) from prothrombin (Factor II). A new model, the cell-based model of anticoagulation appears to explain more fully the steps in coagulation. This model has three stages: 1) initiation of coagulation on TF-bearing cells, 2) amplification of the procoagulant signal by thrombin generated on the TF-bearing cell and 3) propagation of thrombin generation on the platelet surface. Factor Xa plays a key role in all three of these stages. In stage 1, Factor VII binds to the transmembrane protein TF on the surface of cells and is converted to Factor VIIa. The result is a Factor VIIa/TF complex which catalyzes the activation of Factor X and Factor IX. Factor Xa formed on the surface of the TF-bearing cell interacts with Factor Va to form the prothrombinase complex which generates small amounts of thrombin on the surface of TF-bearing cells. 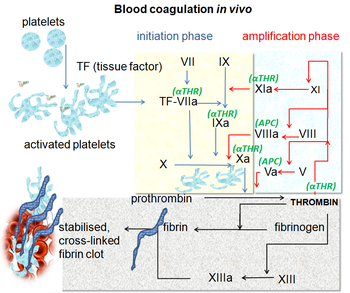 In stage 2, the amplification stage, if enough thrombin has been generated, then activation of platelets and platelet associated cofactors occurs. In stage 3, thrombin generation, Factor XIa activates free Factor IX on the surface of activated platelets. The activated Factor IXa with Factor VIIIa forms the "tenase" complex. This "tenase" complex activates more Factor X, which in turn forms new prothrombinase complexes with Factor Va. Factor Xa is the prime component of the prothrombinase complex which converts large amounts of prothrombin—the "thrombin burst". Each molecule of Factor Xa can generate 1000 molecules of thrombin. This large burst of thrombin is responsible for fibrin polymerization to form a thrombus. Inhibition of the synthesis or activity of Factor X is the mechanism of action for many anticoagulants in use today. Warfarin, a synthetic derivative of coumarin, is the most widely used oral anticoagulant in the US. In some European countries, other coumarin derivatives (phenprocoumon and acenocoumarol) are used. These agents known as vitamin K antagonists (VKA), inhibit the vitamin K-dependent carboxylation of Factors II (prothrombin), VII, IX, X in the hepatocyte. This carboxylation after the translation is essential for the physiological activity. Heparin (unfractionated heparin) and its derivatives low molecular weight heparin (LMWH) bind to a plasma cofactor, antithrombin (AT) to inactivate several coagulation factors IIa, Xa, XIa and XIIa. The affinity of unfractionated heparin and the various LMWHs for Factor Xa varies considerably. The efficacy of heparin-based anticoagulants increases as selectivity for Factor Xa increases. LMWH shows increased inactivation of Factor Xa compared to unfractionated heparin, and fondaparinux, an agent based on the critical pentasacharide sequence of heparin, shows more selectivity than LMWH. This inactivation of Factor Xa by heparins is termed "indirect" since it relies on the presence of AT and not a direct interaction with Factor Xa. Recently a new series of specific, direct acting inhibitors of Factor Xa has been developed. These include the drugs rivaroxaban, apixaban, betrixaban, LY517717, darexaban (YM150), edoxaban and 813893. These agents have several theoretical advantages over current therapy. They may be given orally. They have rapid onset of action. And they may be more effective against Factor Xa in that they inhibit both free Factor Xa and Factor Xa in the prothrombinase complex. American and British scientists described deficiency of factor X independently in 1953 and 1956, respectively. As with some other coagulation factors, the factor was initially named after these patients, a Mr Rufus Stuart (1921) and a Miss Audrey Prower (1934). Factor X has been shown to interact with Tissue factor pathway inhibitor. ^ Ron Winslow; Avery Johnson (2007-12-10). "Race Is on for the Next Blood Thinner". Wall Street Journal. p. A12. Retrieved 2008-01-06. The flurry of interest reflects increasing understanding of what doctors call the coagulation cascade... Four new blood thinners target an enzyme called factor Xa, one of several enzymes that play an important role in the cascade. ^ Skaar, Eric P.; Pulley, Jill; Jerome, Rebecca N.; Pruijssers, Andrea; Shirey-Rice, Jana K.; Margaritis, Paris; Himmel, Lauren E.; Monteith, Andrew J.; Choby, Jacob E. (2019-02-19). "PheWAS uncovers a pathological role of coagulation Factor X during Acinetobacter baumannii infection". Infection and Immunity: IAI.00031–19. doi:10.1128/IAI.00031-19. ISSN 0019-9567. PMID 30782860. ^ "BPL Announces: Strong progress on the world's first licensed Factor X product" (Press release). Bio Products Laboratory. August 10, 2015. Retrieved October 21, 2015. ^ "FDA approves first Factor X concentrate to treat patients with rare hereditary bleeding disorder" (Press release). US FDA. October 20, 2015. Retrieved October 21, 2015. Until today’s orphan drug approval, no specific coagulation factor replacement therapy was available for patients with hereditary Factor X deficiency. ^ Hoffman M, Monroe DM (February 2007). "Coagulation 2006: a modern view of hemostasis". Hematology/Oncology Clinics of North America. 21 (1): 1–11. doi:10.1016/j.hoc.2006.11.004. PMID 17258114. ^ Golan, D. E. (2012). Principles of Pharmacology The Pathophysiologic Basis of Drug Therapy. Philadelphia: Lippincott Williams & Wilkins. p. 387. ISBN 978-1-4511-1805-6. ^ Turpie AG (June 2007). "Oral, direct factor Xa inhibitors in development for the prevention and treatment of thromboembolic diseases". Arteriosclerosis, Thrombosis, and Vascular Biology. 27 (6): 1238–47. doi:10.1161/ATVBAHA.107.139402. PMID 17379841. ^ Broze GJ, Warren LA, Novotny WF, Higuchi DA, Girard JJ, Miletich JP (February 1988). "The lipoprotein-associated coagulation inhibitor that inhibits the factor VII-tissue factor complex also inhibits factor Xa: insight into its possible mechanism of action". Blood. 71 (2): 335–43. PMID 3422166.
Cooper DN, Millar DS, Wacey A, Pemberton S, Tuddenham EG (July 1997). "Inherited factor X deficiency: molecular genetics and pathophysiology". Thrombosis and Haemostasis. 78 (1): 161–72. doi:10.1055/s-0038-1657520. PMID 9198147. Hassan HJ, Leonardi A, Chelucci C, Mattia G, Macioce G, Guerriero R, Russo G, Mannucci PM, Peschle C (September 1990). "Blood coagulation factors in human embryonic-fetal development: preferential expression of the FVII/tissue factor pathway". Blood. 76 (6): 1158–64. PMID 1698100. Messier TL, Pittman DD, Long GL, Kaufman RJ, Church WR (March 1991). "Cloning and expression in COS-1 cells of a full-length cDNA encoding human coagulation factor X". Gene. 99 (2): 291–4. doi:10.1016/0378-1119(91)90141-W. PMID 1902434. Krishnaswamy S (March 1990). "Prothrombinase complex assembly. Contributions of protein-protein and protein-membrane interactions toward complex formation". The Journal of Biological Chemistry. 265 (7): 3708–18. PMID 2303476. España F, Berrettini M, Griffin JH (August 1989). "Purification and characterization of plasma protein C inhibitor". Thrombosis Research. 55 (3): 369–84. doi:10.1016/0049-3848(89)90069-8. PMID 2551064. Fung MR, Hay CW, MacGillivray RT (June 1985). "Characterization of an almost full-length cDNA coding for human blood coagulation factor X". Proceedings of the National Academy of Sciences of the United States of America. 82 (11): 3591–5. doi:10.1073/pnas.82.11.3591. PMC 397831. PMID 2582420. Jagadeeswaran P, Reddy SV, Rao KJ, Hamsabhushanam K, Lyman G (December 1989). "Cloning and characterization of the 5' end (exon 1) of the gene encoding human factor X". Gene. 84 (2): 517–9. doi:10.1016/0378-1119(89)90529-5. PMID 2612918. Reddy SV, Zhou ZQ, Rao KJ, Scott JP, Watzke H, High KA, Jagadeeswaran P (October 1989). "Molecular characterization of human factor XSan Antonio". Blood. 74 (5): 1486–90. PMID 2790181. Kaul RK, Hildebrand B, Roberts S, Jagadeeswaran P (1986). "Isolation and characterization of human blood-coagulation factor X cDNA". Gene. 41 (2–3): 311–4. doi:10.1016/0378-1119(86)90112-5. PMID 3011603. Broze GJ, Warren LA, Novotny WF, Higuchi DA, Girard JJ, Miletich JP (February 1988). "The lipoprotein-associated coagulation inhibitor that inhibits the factor VII-tissue factor complex also inhibits factor Xa: insight into its possible mechanism of action". Blood. 71 (2): 335–43. PMID 3422166. Gilgenkrantz S, Briquel ME, André E, Alexandre P, Jalbert P, Le Marec B, Pouzol P, Pommereuil M (1986). "Structural genes of coagulation factors VII and X located on 13q34". Annales de Genetique. 29 (1): 32–5. PMID 3487272. Leytus SP, Foster DC, Kurachi K, Davie EW (September 1986). "Gene for human factor X: a blood coagulation factor whose gene organization is essentially identical with that of factor IX and protein C". Biochemistry. 25 (18): 5098–102. doi:10.1021/bi00366a018. PMID 3768336. Leytus SP, Chung DW, Kisiel W, Kurachi K, Davie EW (June 1984). "Characterization of a cDNA coding for human factor X". Proceedings of the National Academy of Sciences of the United States of America. 81 (12): 3699–702. doi:10.1073/pnas.81.12.3699. PMC 345286. PMID 6587384. McMullen BA, Fujikawa K, Kisiel W, Sasagawa T, Howald WN, Kwa EY, Weinstein B (June 1983). "Complete amino acid sequence of the light chain of human blood coagulation factor X: evidence for identification of residue 63 as beta-hydroxyaspartic acid". Biochemistry. 22 (12): 2875–84. doi:10.1021/bi00281a016. PMID 6871167. Marchetti G, Castaman G, Pinotti M, Lunghi B, Di Iasio MG, Ruggieri M, Rodeghiero F, Bernardi F (August 1995). "Molecular bases of CRM+ factor X deficiency: a frequent mutation (Ser334Pro) in the catalytic domain and a substitution (Glu102Lys) in the second EGF-like domain". British Journal of Haematology. 90 (4): 910–5. doi:10.1111/j.1365-2141.1995.tb05214.x. PMID 7669671. Morgenstern KA, Sprecher C, Holth L, Foster D, Grant FJ, Ching A, Kisiel W (March 1994). "Complementary DNA cloning and kinetic characterization of a novel intracellular serine proteinase inhibitor: mechanism of action with trypsin and factor Xa as model proteinases". Biochemistry. 33 (11): 3432–41. doi:10.1021/bi00177a037. PMID 8136380. Heeb MJ, Rosing J, Bakker HM, Fernandez JA, Tans G, Griffin JH (March 1994). "Protein S binds to and inhibits factor Xa". Proceedings of the National Academy of Sciences of the United States of America. 91 (7): 2728–32. doi:10.1073/pnas.91.7.2728. PMC 43443. PMID 8146182. Inoue K, Morita T (November 1993). "Identification of O-linked oligosaccharide chains in the activation peptides of blood coagulation factor X. The role of the carbohydrate moieties in the activation of factor X". European Journal of Biochemistry. 218 (1): 153–63. doi:10.1111/j.1432-1033.1993.tb18361.x. PMID 8243461. Padmanabhan K, Padmanabhan KP, Tulinsky A, Park CH, Bode W, Huber R, Blankenship DT, Cardin AD, Kisiel W (August 1993). "Structure of human des(1-45) factor Xa at 2.2 A resolution". Journal of Molecular Biology. 232 (3): 947–66. doi:10.1006/jmbi.1993.1441. PMID 8355279. Sinha U, Wolf DL (February 1993). "Carbohydrate residues modulate the activation of coagulation factor X". The Journal of Biological Chemistry. 268 (5): 3048–51. PMID 8428982. 1lpg: CRYSTAL STRUCTURE OF FXA IN COMPLEX WITH 79. 1lpk: CRYSTAL STRUCTURE OF FXA IN COMPLEX WITH 125. 1lpz: CRYSTAL STRUCTURE OF FXA IN COMPLEX WITH 41. 1lqd: CRYSTAL STRUCTURE OF FXA IN COMPLEX WITH 45. 2boh: CRYSTAL STRUCTURE OF FACTOR XA IN COMPLEX WITH COMPOUND ""1""